I had some coconut cream that needed using up and I found a few recipes making homemade Mounds type bars. They were easy and very delicious. You can adjust the sweetener to taste, if you like them more or less sweet. 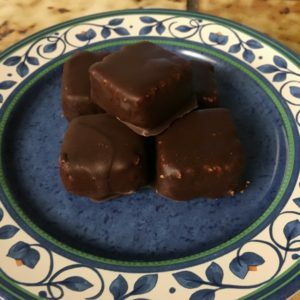 I made little squares and put them in the brownie tray, linked below. Prepare the chocolate coating, I melt the cocoa butter in a double boiler until melted. You could also microwave it for a minute at a time until melted. Add cocoa powder and sweetener and mix until everything is blended. Now dip the bars in the cocoa mixture, and turn to all sides to coat evenly. It helps if the bars are frozen solid, I use a spoon and dip then on all sides. I put the finished bars on a plate with wax paper on the bottom and between any layers. Once done and cooled you can store them out, but as it’s summer I store them in the fridge.